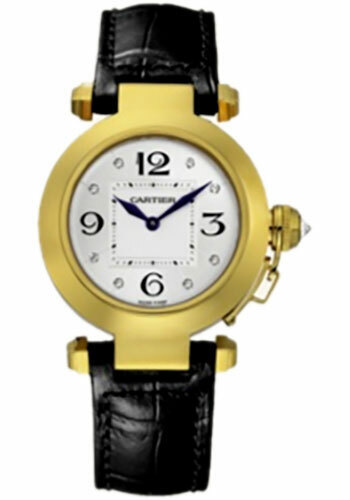 32mm 18K yellow gold case, silver sunray dial set with eight diamonds, quartz movement. Comes with interchangeable alligator and fabric straps and one 18K gold deployant buckle. Water resistant to 30 meters (100 feet). 32mm 18K white gold case, silver sunray dial set with eight diamonds, quartz movement. Comes with interchangeable alligator and fabric straps and one 18K gold deployant buckle. Water resistant to 30 meters (100 feet). 32mm 18K pink gold case, silver sunray dial set with eight diamonds, quartz movement. Comes with interchangeable alligator and fabric straps and one 18K gold deployant buckle. Water resistant to 30 meters (100 feet). 32mm 18K white gold case and bezel set with diamonds, silver sunray dial, quartz movement. Comes with interchangeable alligator and fabric straps and one 18K gold deployant buckle. Water resistant to 30 meters (100 feet). 32mm 18K white gold case and bezel set with diamonds, silver sunray dial, quartz movement. Comes with interchangeable18K gold bracelet set with diamonds and alligator strap with 18K gold deployant buckle. Water resistant to 30 meters (100 feet). 32mm 18K white gold case, 18K white gold grid set with diamonds, silver sunray dial, quartz movement. Comes with interchangeable alligator and fabric straps and one 18K gold deployant buckle. Water resistant to 30 meters (100 feet). 32mm 18K pink gold case, 18K pink gold grid set with diamonds, silver sunray dial, quartz movement. Comes with interchangeable alligator and fabric straps and one 18K gold deployant buckle. Water resistant to 30 meters (100 feet). 32 mm 18K white gold case set with diamonds, diamond bezel, white mother of pearl dial with large Arabic numerals set with diamonds, quartz Cartier calibre 690 movement, 18K white gold bracelet. Water resistant to 30 meters. 32 mm 18K white gold case set with diamonds, diamond bezel, white mother of pearl dial with large Arabic numerals set with diamonds, quartz Cartier calibre 690 movement, lizard strap with 18K gold double deployant buckle. Water resistant to 30 meters.